Last week the High Court found that five members of Parliament were dual citizens and thus incapable of being chosen to sit in the Parliament at the election in July last year. A by-election is being held in the seat of New England and recounts of the July election are being held for the four Senate seats. Then this week we found out that the Senate President, Stephen Parry, is a dual citizen of Australia and the UK. He has resigned from the Senate. This morning we woke up to headline news that Energy and Environment Minister Josh Frydenberg might be a dual Australian and Hungarian citizen. And there are still also questions about the Member for Gilmore Ann Sudmalis who in August released a form showing that she hasn’t applied for UK citizenship in the period since 1986. However it remains unclear whether she may be eligible for UK citizenship by descent. Her situation is eerily similar to that of Nash and Parry. It is feared that Parry will not be the last Member of Parliament that will need to fess up about foreign citizenship. The Senate crossbench are calling for a full audit of all MPs, to ensure that everyone in the Parliament is entitled to have been elected in July last year. The two major parties have so far not been in favour of an audit. On top of all of this, some of the candidates that are the likely replacements of some of the Senators found to be invalidly elected last week may have section 44iv problems (office of profit under the Crown). Although the Government has announced that one of them is okay to take a spot in the Senate, it will likely need to be sorted out by the High Court. If the Government doesn’t refer this to the Court, someone else may refer it by using the Common Informers (Parliamentary Disqualifications) Act. So there is still a lot going on and it’s not likely to be sorted out quickly. The Governor‑General may appoint officers to administer such departments of State of the Commonwealth as the Governor‑General in Council may establish. Such officers shall hold office during the pleasure of the Governor‑General. They shall be members of the Federal Executive Council, and shall be the Queen’s Ministers of State for the Commonwealth. When did the three months run out for Nash and Joyce? Was it three months from when the Parliament was dissolved on 9 May 2016. Was it three months from when the election occurred on 2 July 2016? Or three months from when they were sworn in? Some commentators believe that the common law doctrine of ‘de facto officer’ might be applied, meaning that they should have just stood down once they found out they were dual citizens. There may be a few decisions. The Attorney-General said that we’ll look at those. Researchers at the Parliamentary Library have identified at least 20 legislative instruments and 47 ministerial announcements made by Mr Joyce that could be subject to challenge. For Ms Nash, it identified eight legislative instruments and 43 ministerial announcements. Our system of government is based on the principle of Responsible Government. Ministers are elected by the people to the Parliament and are subject to the control of Parliament. Those Responsible Ministers then advise the Governor-General. The Governor-General acts on the advice of his or her Ministers to issue regulations and proclamations under existing laws and authorises many other executive decisions by Ministers. So those 28 legislative instruments (regulations) listed above, were signed off by the Governor-General on the advice of these Ministers. Some are wondering whether the Governor-General might be caught up in this turmoil. People have started asking, when did Barnaby Joyce and Fiona Nash cease being Responsible Ministers. When they ceased being Responsible Ministers did it become unlawful for them to advise the Governor-General? And what are the consequences of a government unlawfully providing advice to the Governor-General? 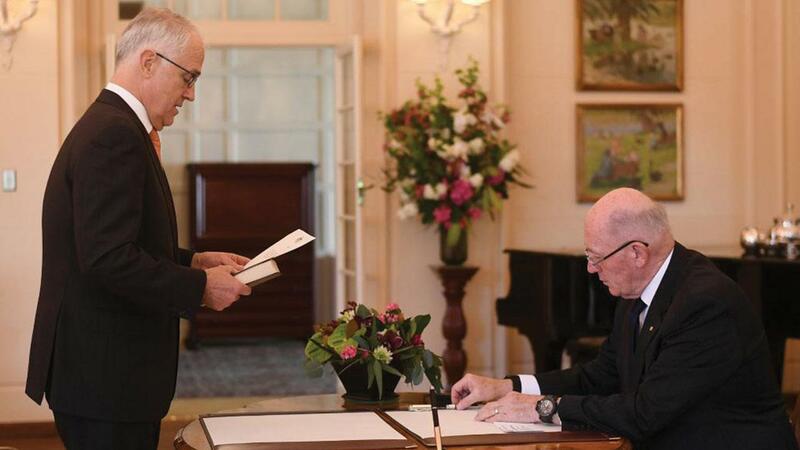 What advice did the Governor-General receive and who gave him the advice that these two Ministers were able to lawfully remain in their positions? The law is the law and it applies to everyone. On Friday last week the High Court reconfirmed that you cannot be a member of the Australian Parliament if you are eligible to hold foreign citizenship. The precedent set by Sykes v Cleary in 1992 was upheld. The High Court did not make a new or different interpretation of section 44i. Being a dual citizen and sitting in Parliament is a serious matter. Every candidate that nominates for Parliament has to sign a legal declaration that they comply with section 44 of the Constitution. Falsely filling out a legal declaration is a serious matter. Knowingly making a false or misleading statement in any claim for enrolment or in any declaration for nomination is a criminal offence punishable for up to 12 months prison under the Criminal Code Act 1995. The nomination form tells candidates to get legal advice if they have any doubts about their eligibility under section 44 of the Constitution. This Act, and all laws made by the Parliament of the Commonwealth under the Constitution, shall be binding on the courts, judges, and people of every State and of every part of the Commonwealth, notwithstanding anything in the laws of any State…. ‘This Act’ means the Constitution and it is ‘binding on the courts, judges, and people of every State and of every part of the Commonwealth’, this includes all Members of Parliament. These people have been elected into leadership positions in Australia. It is understood that every Member of Parliament must act ethically, honestly and with integrity. This could be why there was such public anger about Stephen Parry withholding the information about his potential dual citizenship. On advice from the Prime Minister, the Governor-General can end the current session of Parliament. This means that all Parliamentary work grinds to a halt, but the Executive continues. An existing department may be able to be conduct an independent audit authorised by the Executive power. Then any MP or Senator found to be a foreign citizen could be removed and by-elections or recounts held before a new session of Parliament is started by the Governor-General. In the context of cascading citizenship bombshells, it pits a loathed political class of parties….against a disintegrated but newly expressive populace hell-bent on proving that the establishment was always serving itself. And here it seems, is that proof. Politicians who cannot fill in forms. MPs who make law but demand exemption from it. Political parties who cower behind secrecy insisting they've complied absolutely while refusing to furnish any proof. Politicians insisting it's all business-as-usual, miss the point that this is actually the grievance. Australians need to be assured that everyone in our Parliament is legally entitled to be there. Some commentators are suggesting that unless something is done soon, the Governor-General may be forced to consider using his reserve powers. Surely no one wants to see a repeat of the Constitutional Crisis of 1975.